Comments: The Grove House at 385 Harrison Street was built ca. 1932 by Annie and Marjorie Nicholas on land purchased from the Presbyterian Church. The home was built on the site of the old Presbyterian cemetery with the stipulation that church members could use its bathroom. 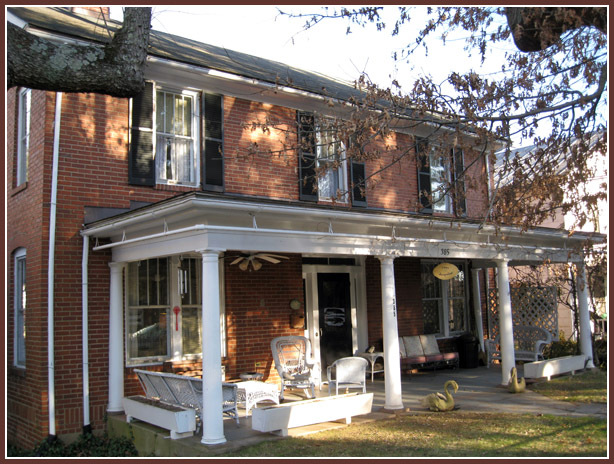 A few years later, the Nicholas family converted their home into the a rooming and boarding house for teachers. Between the mid-1930s and mid-1960s, a number of teachers at the Scottsville High School resided there. In 1978, Jesse and Jacqueline (Beal) Grove bought this home and completely renovated it. The above photo is from the Connie Geary Collection at Scottsville Museum. Reference: U.S. Department of the Interior, National Register of Historic Places, Scottsville Historic District (Updated Nomination and Boundary Increase 12/3/2003; VDHR File No. 298-0024, Section 7, page 10).